While it is fairly certain that Zombies do not buy products and services, there seems to be a large number of Zombie lovers online. From the infamous depiction of Zombies in George Romero’s ‘Night of the Living Dead’, to the current obsessions with ‘Walkers’ on The Walking Dead, it seems clear that there is an ‘appetite’ for Zombies. And we’re not talking about BRAINS! There are a surprising number of Zombie related products available for Zombie aficionados. There are Zombie gardening displays, where the Zombie is coming up out of the ground. There are Zombie kettle bells for weightlifters who want to swing a Zombie head while working out. And of course a huge number of Zombie T-shirts, mugs, jello brain molds and more. Basically, if you have a Zombie related product to sell, there are a lot of people who are interested. One of the great aspects of working with Niche Ad Network is that there is an ad Channel for just about every niche market one can think of. And more are being added as Niche Ad Network grows. For Publishers who have spent time and effort building out Zombie related websites filled with Zombie forums, Zombie movie reviews and general Zombie related content, Niche Ad Network is perfect. 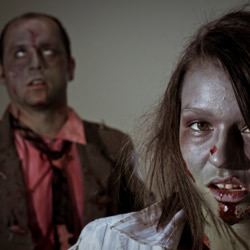 Publishers need only add the Zombie Channel Ad Zone into their site and Zombie related ads will begin to appear. What better way to monetize a Zombie related website than with Zombie related ads? If you have Zombie related products or services, and you want to reach Zombie lovers, what better place to promote your products than on Zombie related websites? There isn’t a better place, except maybe a mall. Zombies, and those chased by Zombies, seem to love malls for some reason. Aside from malls, the best place for Advertisers to promote their Zombie related products is within the Niche Ad Network Zombie Channel Ad Zone appearing on Zombie related sites. By focusing attention on sites filled with Zombie lovers, Advertisers are sure to have their products seen by people more inclined to be interested in them. In fact, if Advertisers don’t jump at this opportunity, one would have to question whether or not they have any BRAINS!